“Dilegua, o notte! Tramontate, stelle! Prince Calaf, defying death, sings to light as a symbol of victory and of life itself. Light is more than a feeling. It is a physical entity, and just like gravity, light is a key element, an ineludible truth conceived in the baseline of the creative architectural process. Architecture, with its monumentality or lightness, has always challenged gravity. Gravity can only be defeated by the rational use of light; and light can be subdued and controlled as a primeval material of the creation of space. When the architect manages to deceive the sun; the light, by piercing the space locked within massive structures, the ambience then floats, it levitates. 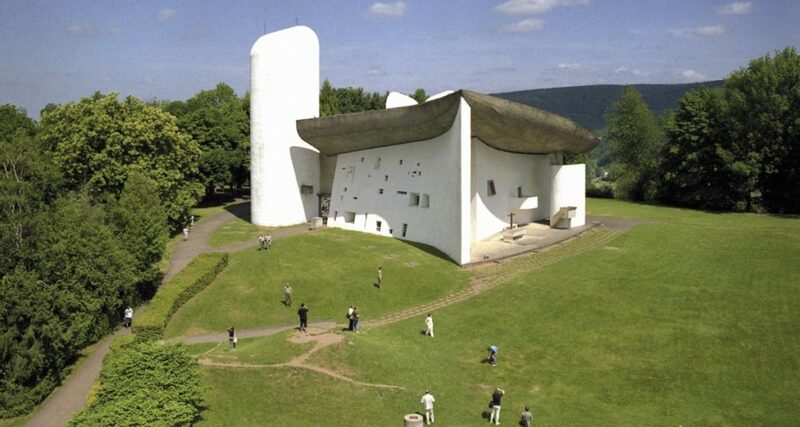 Rome’s Pantheon and the Notre-Dame du Haut en Ronchamp church are indelible proofs of this phenomenon. 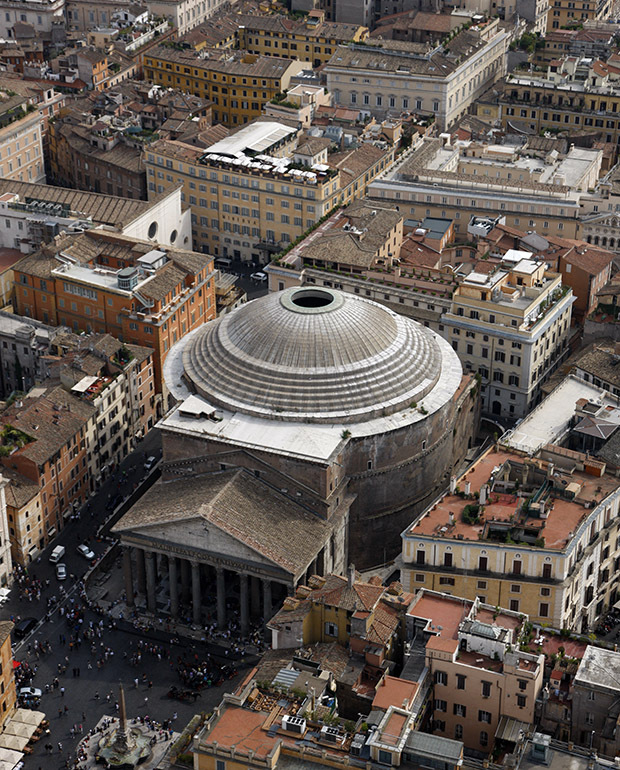 The Pantheon, rebuilt during the Hadrian Empire, is renowned for its dome; one of the largest in the world. This dome is distinguished by an oculus; a 9-meter diameter hole that represents the eye through which all gods watch over men. 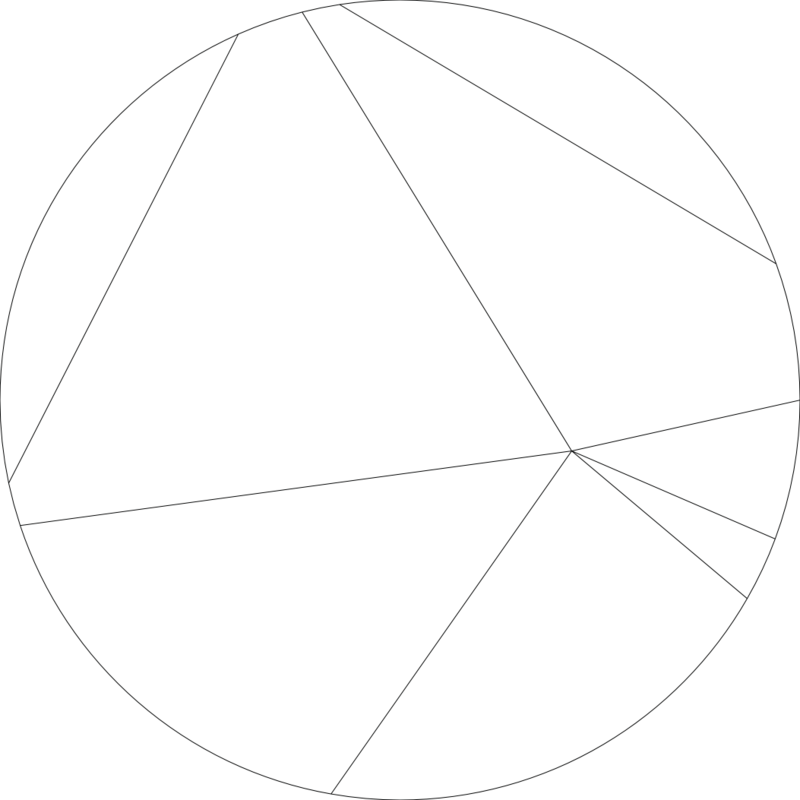 According to the Greek philosophy of the architect, the sphere represents the perfect geometric solid, symbol of the heavenly vault; symbol of the divine. When devotees enter the Pantheon, they find themselves immersed in a 43-meters in diameter sphere, designed by the two main lines of their lives: the horizontal landline that connects the entrance of the apse, and the vertical celestial line; the axis mundi, that allows them to meet the divine through the oculus. The overhead light that enters from the oculus is the only source of light that draws the interior space. A beam of light that comes from infinity and enters the building with energy, enfolds the man in his contemplative act and protects him by a shield of golden light. 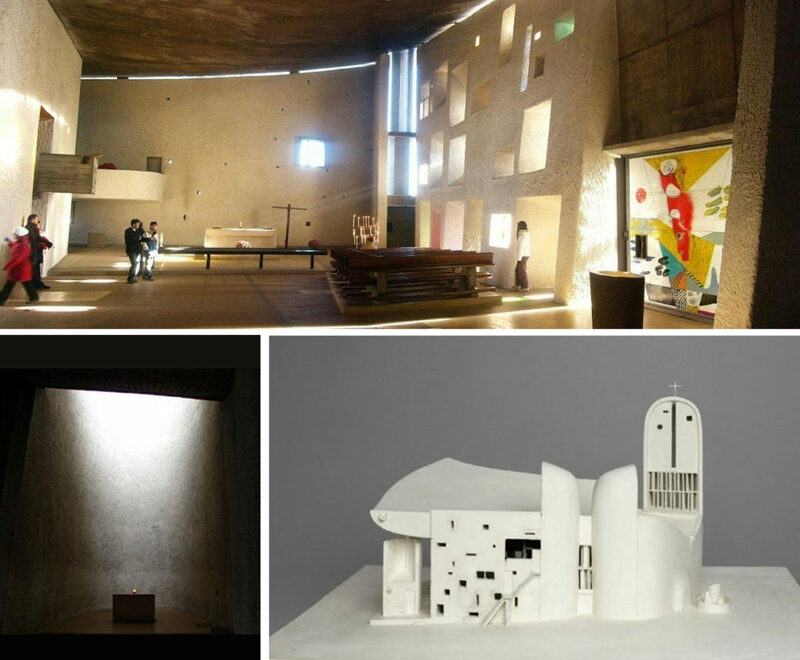 Notre-Dame du Haut shadow’s contrasts, curvilinear volumes, and apparent lightness make up a place for meditation, in which the architect builds a direct dialogue between matter and light, between the earthly and the divine. In this project, light is the main material for design. Direct and scathing light enters through the south façade windows generating a similar effect to that of a starry night. 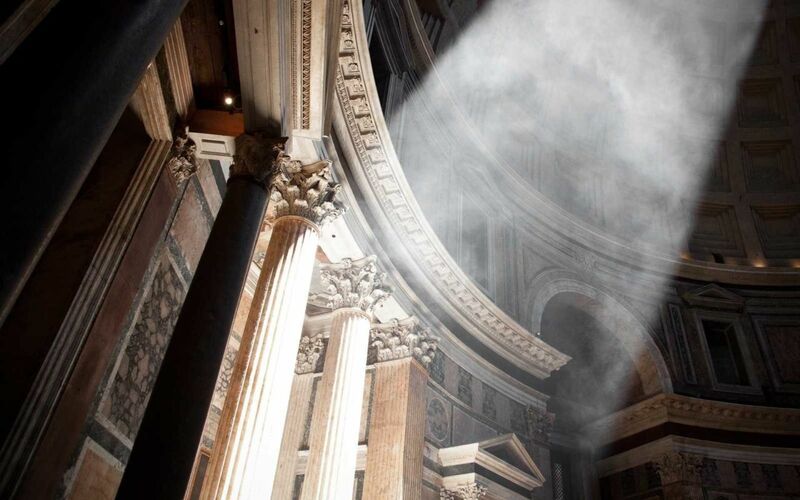 The second source of light, soft and indirect, leaks from an interstice, of about 10 centimeters, in between the perimeter walls and the veil that acts as a roof held by hidden pillars. Beyond this rooftop, the towers extend, capturing and spreading the light, going down through its internal walls until it reaches the altar, wrapping it in a diffusive glow that transforms the altar into a meditation center. 2. Interior light and model. An antique fort’s watchtower that belongs to the monks of the Hospitaller Order shelters a space destined to Zen Meditation. 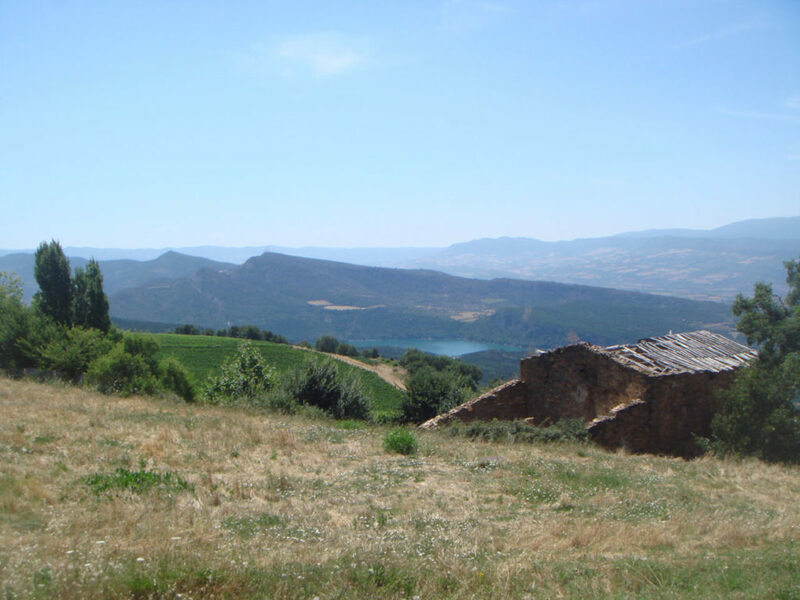 The silence of the Pyrenean mountain, the image of the distant peaks, and the afternoon sun focus in a place that transcends the present moment and opens to infinity. 2. Interior perspective and relation with the exterior.